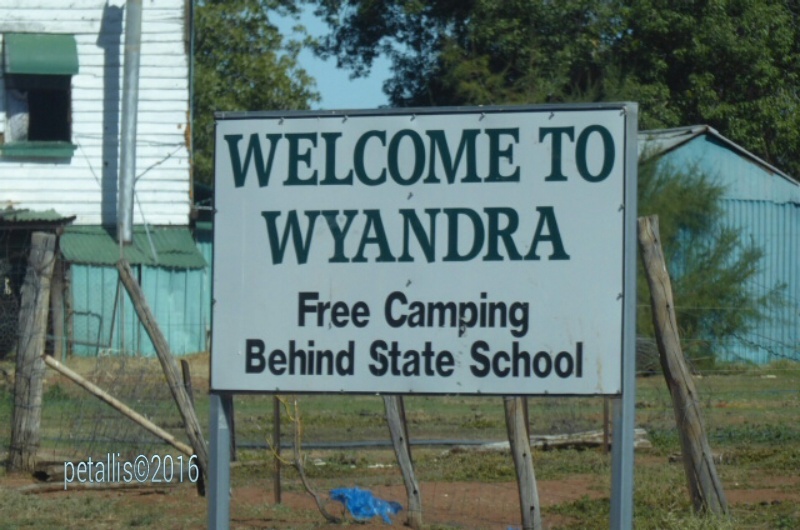 We left Cunnamulla to drive to Charleville and on the way we stopped at Wyandra. It is halfway between the two towns. We looked at the caravan park and the free camping behind the school. $20 a night for a powered site is pretty good, and it is right in the centre of the town, so convenient for me to walk to the pub for dinner. We like to spend money in the towns we visit, as so many towns are struggling. 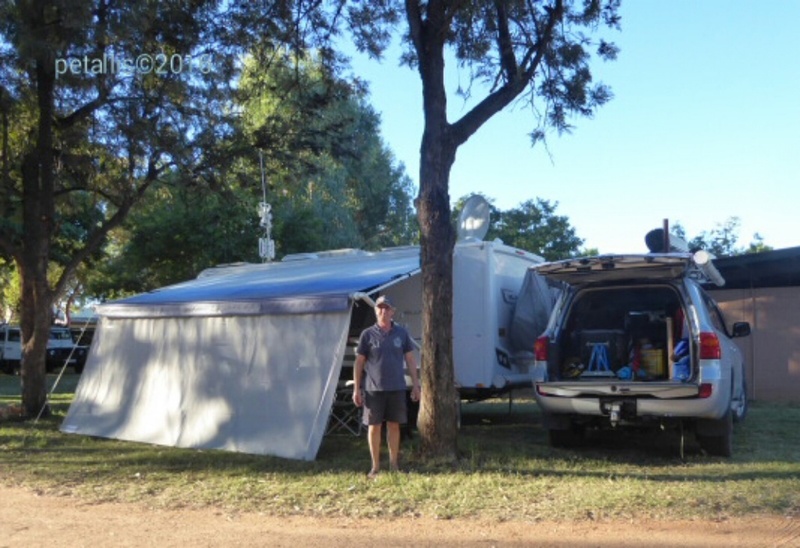 We didn't stay this time, but will plan another trip and stay in the van park to do washing and have pub dinner, and then move up to the free camp for some happy hours around the campfire. 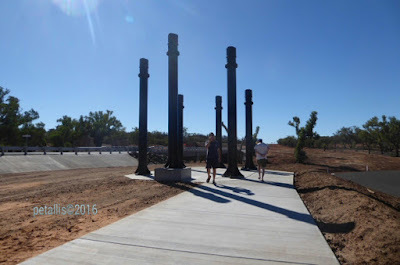 Just before Charleville we came to the site of the Angellala Bridge Explosion. 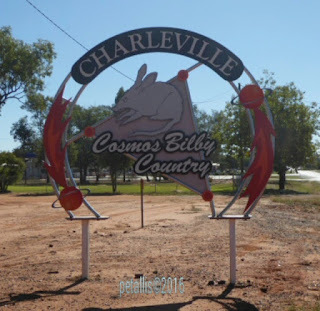 30 kilometres south of Charleville, a truck carrying 53 tones of ammonium nitrate caught fire and exploded on 6th September 2014. Once in Charleville we headed for the information centre which is housed in the Cosmos Centre. 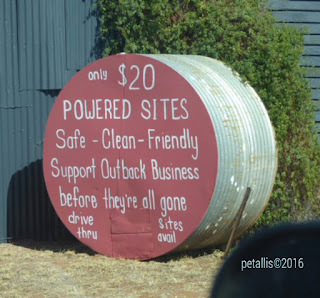 We signed up for Outback Mates Card, not because there were a lot of good deals, they are not but the concept is new so will hopefully get better. We wanted one deal in particular. Last time here we stayed at The Bailey Bar and liked it, so wanted to stay two nights there again. Outback Mates had a Bailey Bar deal pay for 3 get one free, so we stayed for four nights. The park was full due to the Charleville Show and the Variety Big Bash leaving from Charleville in a few days, however the manager found a spot, which was ok.
Charleville is the largest town in south-west Queensland and dates back to 1847. It was surveyed in 1867 and is situated on the banks of the Warrego River. It once had Cobb and Co's largest and longest running coach making factory. There are so many things to see and do in Charleville. *The Cosmos Centre operates many different tours, and is the info centre. Tours range from self guided to organised, both day and night. The only tour we didn't do last time was the night observatory viewing, so we did it this time. It was very good, our only criticism is that there were too many people, so time on the telescopes was very short. *The Bureau of Meteorology for a tour and to see the weather balloon released - free and we'll worth a visit. * Hotel Corones was built on the Hotel Norman (1895) and added to in four stages to become the grand hotel it is today. The grand ballroom is now a bottle shop, but one can still see the dream that Harry Corones had. There is a tour $25, that is worth the money to hear the stories behind the making of this hotel. The hotel hosted many important people including Amy Johnson. One can have a drink at the longest bar in the Southern Hemisphere, and look at the memorabilia in the grand foyer. Around the airport are many remains from WWII when the US had a base camp there. 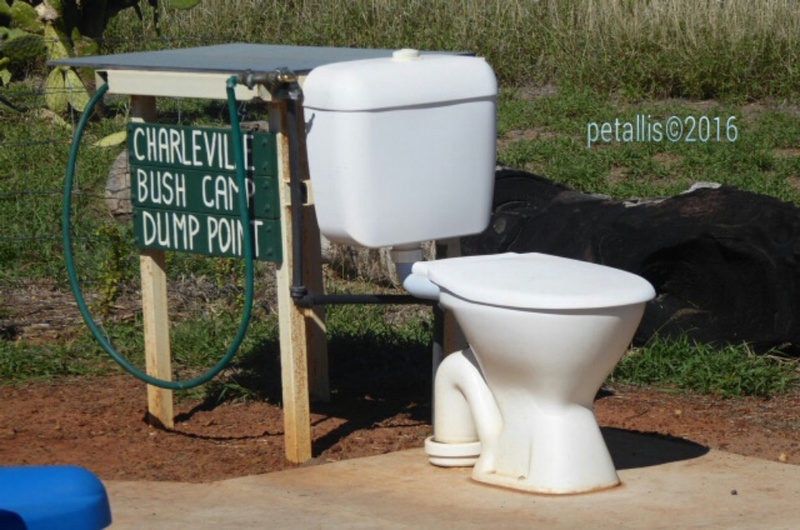 In 1942 Charleville was inundated with American Service men when the airport became one of the most top secret airbase in Australia. 101 buildings were constructed and the remains of many can still be seen. 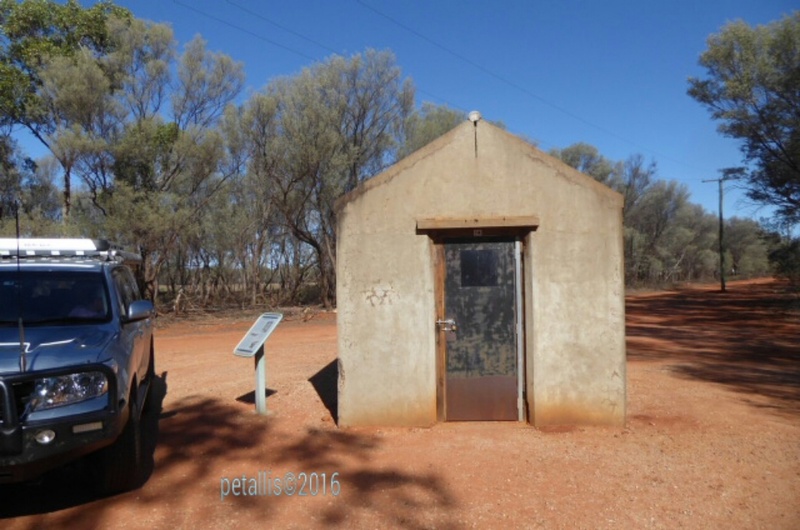 There is a convey tag along tour from the info centre for $15, but we did a self guided one as the areas are well sign posted and information boards explain the history. 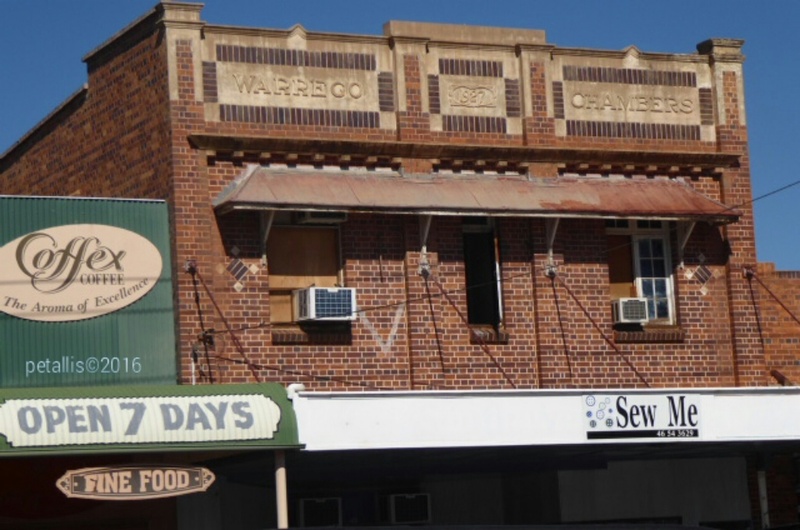 We walked around the main area of town, and like Cunnamulla many shops are closed or empty. 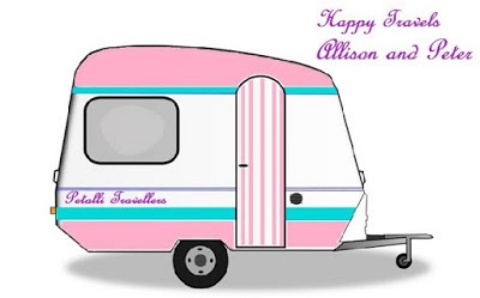 Even the fabric shop 'Sew Me' had downsized greatly from our last trip. 'Heinemanns Bakery and Cafe' next door was doing a good steady business every time we were there, and so was the chemist around the corner. 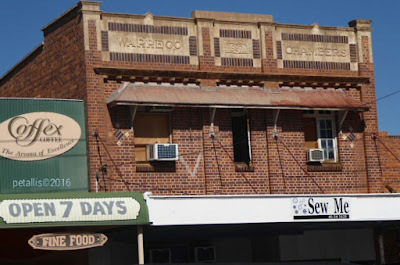 The building below shows both the fabric shop and the bakery. Notice the V painted on the bricks near the air-conditioned, this was painted to signify victory in the Pacific. We did a drive a little further out from Charleville to look at the bush camping. 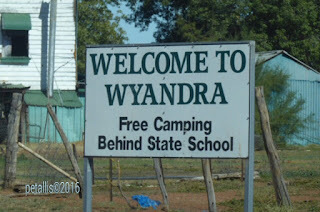 Seems ok, but we like Bailey Bar and it is not to expensive and the staff are great, so are the camp dinners. There is nothing left that we want to do in Charleville, but it is a good base to stock up before heading further outback.